The "pay to slay" policy has emerged as a chief diplomatic hurdle in peace talks between the Israelis and Palestinians, sources told the Free Beacon, and Greenblatt used his perch at the U.N. to send a clear message: These payments must stop immediately if the Palestinians are to be seen as a serious partner for peace. "It is astonishing that in the year 2019, the Palestinian Authority has not yet taken any steps to end these morally-repugnant payments," Greenblatt told the Security Council, according to one diplomat in the room, who briefed the Free Beacon about his remarks. "It is bewildering that the international community has not been more vocal in condemning this practice." "If your citizens were being routinely attacked by terrorists, which of you would tolerate a reward system that compensated the attackers for their crimes?" Greenblatt asked the room. "How can we possibly censure Israel for taking the same stance?" 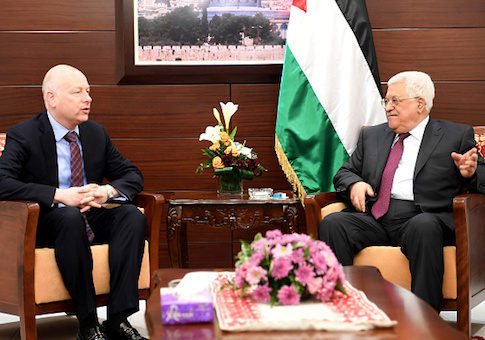 The Palestinian budget crisis hinges on one issue, Greenblatt said: The government's insistence on spending a significant portion of its budget to take care of terrorists. "The system the Palestinian Authority has set up to make payments to terrorists and their families is not a social welfare system, no matter how inaccurately it is described," he said. "The system created by the Palestinian Authority only creates incentives for further acts of terrorism." One U.S. official familiar with the remarks told the Free Beacon that Greenblatt offered some hard truths in an atmosphere where they are not often heard. "Jason spoke truth to a room that needed to hear it," the official said, speaking only on background. "There is no excuse to single out Israel as the reason for this manufactured crises when the Palestinian Authority continues the practice of paying terrorists. This reprehensible practice should be a no brainer issue that the international community can unite around and push the PA to stop this practice and instead focus on making the lives of its people better. Greenblatt went on to reject claims that Israel is the source of this crisis, saying that the source of the P.A. 's woes is its insistence on using international aid dollars to pay convicted terrorists. "It is entirely inappropriate to focus on Israel as the source of this crisis," he said. "It is the Palestinian Authority that has chosen to manufacture the current crisis." "Israel is withholding 5 to 7 percent of monthly clearance revenues, a step Israel took in response to the Palestinian Authority's abhorrent practice of using those funds to make payments to terrorists and their families," Greenblatt said. "It is the Palestinian Authority that has chosen to reject all remaining clearance revenues, which amount to up to 95 percent of the revenues to which they are entitled." The Palestinians are manufacturing their own budget crisis in order to paint Israel as a pariah, Greenblatt said. "The Palestinian Authority is refusing to accept over $150 million in revenue to protest the fact that $11 million is being withheld, only to make a political point. Does that sound like a governing authority that is concerned with the welfare of its people?" he asked. The United States stands by Israel as it withholds funds that would otherwise be spent on Palestinian terrorists, a policy the P.A. has not only endorsed, but refused to abandon in the face of pressure from the Trump administration and a wide swath of Congress. "The Palestinian Authority has the right to challenge Israel's withholding of the five to seven percent of the clearance revenues that would otherwise be used to pay terrorists and their family members—although I would hope they would garner few supporters for any defense of this indefensible ‘pay to slay' policy," Greenblatt said. "But let's not kid ourselves. The small percentage of revenue transfers that is being withheld by Israel is not what is causing this crisis." Israel remains willing to transfer around 95 percent of revenues to the P.A., money that would be used to fund key infrastructure projects, health works, and the salaries of critical personnel. "The Palestinian Authority can prevent the withholding even of the small percentage of funds by Israel by ceasing the despicable practice of using public funds to make payments to terrorists and their families," Greenblatt said. The "pay to slay" policy remains in place, with little protest from U.N. members who view Israel as the source of the crisis. "Plainly put: the system rewards terrorism. That is why President Trump signed into law the Taylor Force Act, which makes clear that the United States absolutely, without qualification, rejects payments rewarding terrorism," Greenblatt said, referring to a recently passed U.S. law banning the use of aid dollars for the pay to slay program. In the face of this law, as well as the Trump administration's repeated rebukes, the Palestinian government has made clear that it will not end this policy. "We must acknowledge that peace can only be achieved by those who reject violence and terror," Greenblatt said. "The Palestinian Authority's institutionalization of support for terrorism is unacceptable and must be called out, unequivocally by all of us. The time has come for everyone to stop looking the other way." Greenblatt urged U.N. member nations to make their opposition to this policy known. "The time has also come for all of us to make it clear that the Palestinian Authority, if it aspires to the status of a government, must behave like one," he said. "It is unacceptable for the Palestinian Authority to pay these terrorists and their families a reward for criminal acts. It is unacceptable for the PA to divert its funds and fail to pay the hard working civil servants who teach in Palestinian Authority schools, patrol the streets in uniform, and provide medical care to the sick. The Palestinian Authority would rather pay terrorists than ordinary Palestinians and their families. What a shame!" This entry was posted in National Security and tagged Israel, Palestinian Authority, United Nation. Bookmark the permalink.